“We want to find exactly how, when, and where our natural desires have warped us. We wish to look squarely at the unhappiness this has caused others and ourselves. By discovering what our emotional deformities are, we can move toward their correction … Without a searching and fearless moral inventory, most of us have found that the faith which really works in daily living is still out of reach” (12 Steps and 12 Traditions). 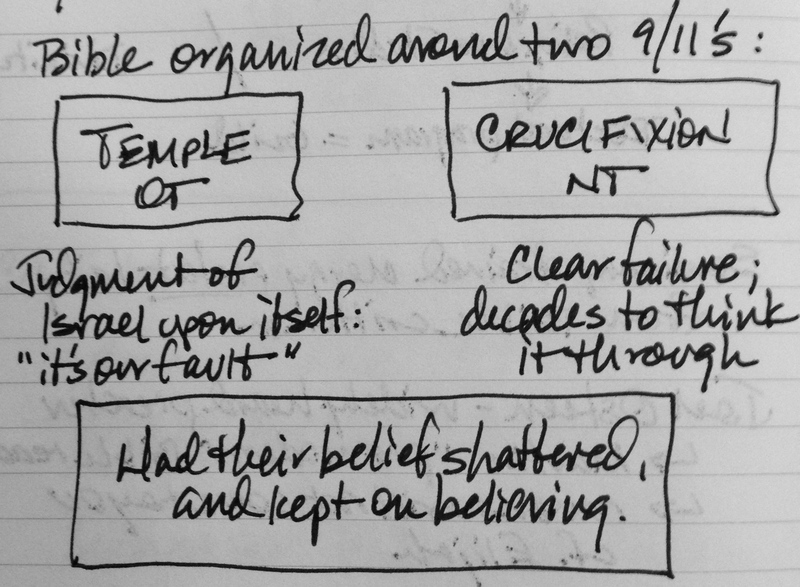 Notes from the first session of John Dally’s “This Dangerous Book: Strategies for Teaching the Bible” at Seabury. Three weeks ago, I wrote about one of the central ideas from the class I am taking at Seabury this fall: that the Bible is organized around two 9/11’s. How do your prayers and your reading of Scripture both challenge and comfort you today? This entry was posted in Daily Office and tagged 9/11, AA, Babylon, exile, Ezra, fearless, fearless moral inventory, Hebrew Bible, John Dally, moral inventory, Nehemiah, Psalm 78, Seabury, searching, Step Four, Temple on November 12, 2013 by Rodger Patience.